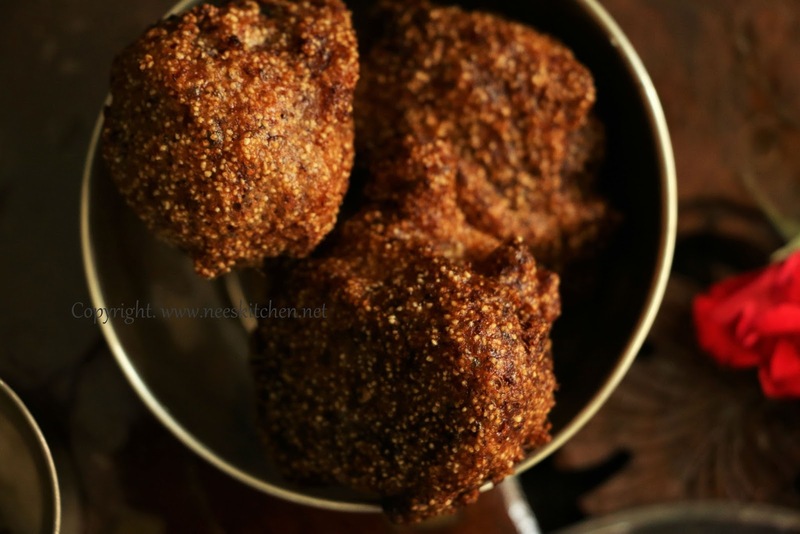 Suzhiyam or boorelu is a traditional dish made Tamilnadu & Andhra for many festive occasions. Not all sweets need to be made from sugar & jaggery. With the rise in numbers of diabetes all over the world we need to start looking for alternative sweet content in our traditional dishes. 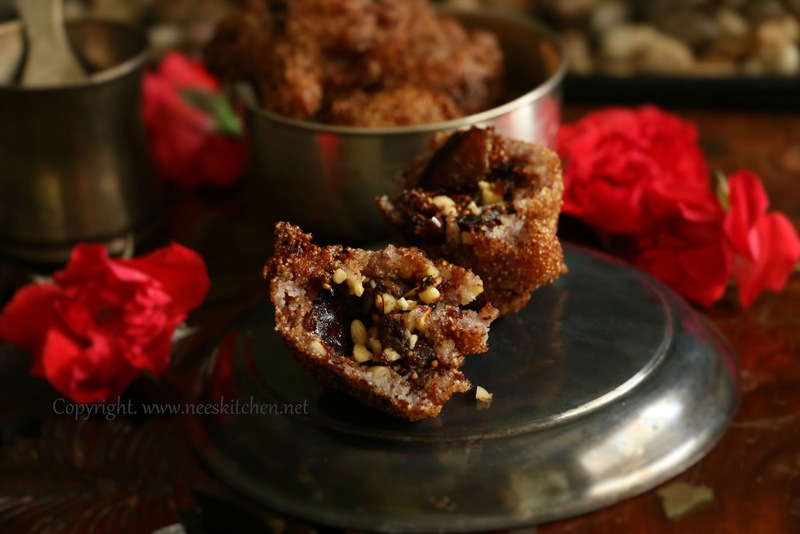 This dish made out of dry fruits & nuts dipped in black rice batter is perfect for any occasion. This is my old recipe but it definitely needed a good look. The dish is so tasty and without good picture it does not make my post complete. Today being Varalakshmi Vratham I made this for my poojai and took a quick shot also. Generally I don't shoot and post on the same day but today I desperately wanted to post this. 2. Grind them in mixie if small quantity or grinder if the quantity is more. 3. Grind Urad dhal until it becomes like a butter consistency. 4. Add idly rice ,black rice, salt and water. Make sure it is ground like an idly consistency. 5. Leave it for 4 -6 hrs for fermentation. This step is optional for this dish. If you ferment you may use the remaining batter for making dosa. 6. 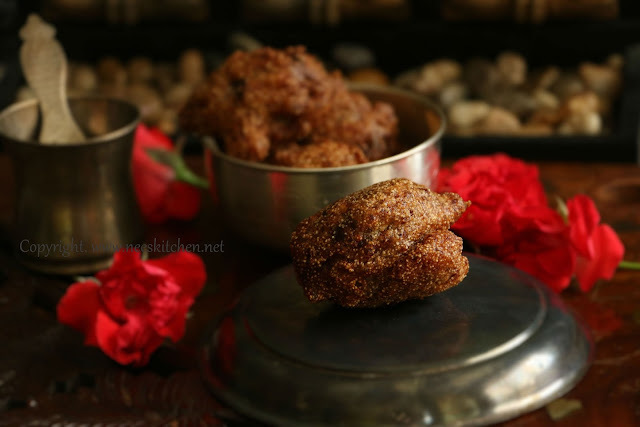 Once the grinding is complete add rava and make the batter thick enough to dip the dryfruit balls. 7. Dry roast the nuts until the raw smell leaves and grind it in a mixie. 8. Add ghee,dry fruits and give a good mix. After 3 minute’s elachi and cook until they form a sticky consistency. Sprinkle water if needed. Water is surely needed if you are using raisins. 9. Lastly add the powdered nuts and mix it well. Switch off the gas. 10. Grease ghee in your palms and make the mix as round balls. This needs to be done when the mix is hot else we cannot bind them together. 11. Heat oil in a deep fry pan. 12. Dip the balls made out of nuts in the batter and fry until the ssshh sound stops. 13. Take out and put them in a tissue paper for take out the excess oil. 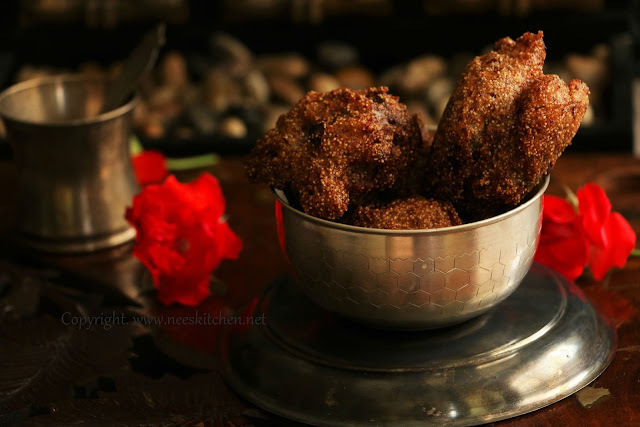 Suzhiyam or boorelu is ready to be served. The quantity mentioned above can be adjusted based on your needs, however the proportion must not be changed. You may completely use black rice in 3 proportions. I have added 1 portion of idly rice as it will not compromise on regular boorelu taste. You may wish to ignore black rice and make it 3 proportions of white rice also. Do not use this batter for idly but you can make them as dosa’s.